Graham Bubb & All Metal Construction have completed countless projects for various contractors and customers all over the state of California, so he knows a good metal building when he sees one & Armstrong Steel is Bubb's building of choice. Armstrong Steel connects end users with experienced builders like Bubb through it's nationwide dealer network in an effort to streamline small building projects. DENVER -Graham Bubb, a full-service commercial, agricultural, and residential steel builder located in California, came to Armstrong Steel when his customer wanted to put up a steel building. As a contractor, Bubb works closely and frequently with Steel OEMs across the United States. Armstrong Steel distinguishes itself in the national arena with its superior customer service. Armstrong Steel has a small core of employees that are dedicated to specific areas of your building, so no detail is ever lost in translation, and every customer can count on support that is personally tailored to their project. 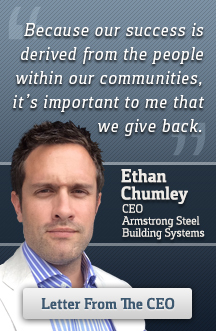 Armstrong's commitment to customer service is truly unrivaled in the steel industry. Delivery also plays a major factor in customer satisfaction at Armstrong Steel. "On Time. On Budget." has been Armstrong's motto since the company's inception. Armstrong Steel prides itself on getting customers the building they want, when they want it, while ensuring that all accessories arrive on time. "Bubb's experience with Armstrong Steel is a prime example of what we do best. We are so often entrusted with a customer's mission of turning thoughts, dimensions, ideas, and bar napkin sketches into tangible, final products - buildings our clients can be proud of for years to come. Armstrong Steel's nationwide dealer network, as well as our in house detailers and project managers, are dedicated to visualizing the completion of each project, then moving backward and making it a reality in terms of daily achievements," said Ethan Chumley, Armstrong Steel's CEO. Bubb's experience with Armstrong represents just one of the many success stories the company has helped write. In his own words, "When my customer needed a steel building, I went to Armstrong Steel, they were helpful, courteous and got the building designed and delivered on time. The detailed drawings were easy to read and all the material arrived accounted for. When I had questions during the installation process, Armstrong Steel was there to help, all the way. I would use Armstrong Steel again to design and supply my next customer's new steel building. Thank you for all your help!" Armstrong Steel was more than happy to assist in Graham's project and will be there for any of his future needs. Armstrong Steel has grown from a small metal buildings supply company to the #1 pre-engineered metal building OEM manufacturer in the nation. Armstrong's insistence on low prices and excellent quality catapulted them into national prominence - it was those low prices that allowed them to expand into new markets in the years that followed. One of the company's core strengths is its ability to self-perform a large portion of field work, providing optimal control over safety, cost, schedule and quality. Additionally, Armstrong's in-house project managers and draftsmen work closely with clients and field teams to create safe, cost effective building solutions with minimal environmental impact.